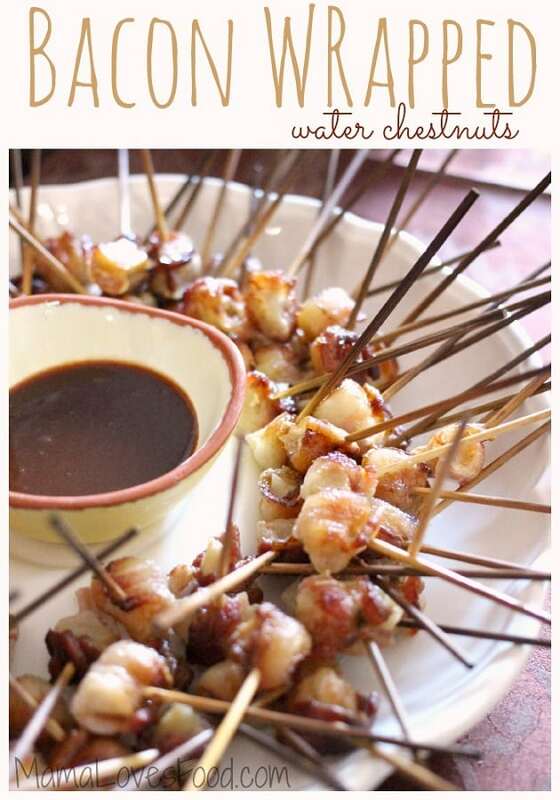 Bacon Wrapped Water Chestnuts are the perfect classic party appetizer for your next get together! These Bacon Wrapped Water Chestnuts are a total throwback to the early nineties, teased hair, and tall shoulder pads. 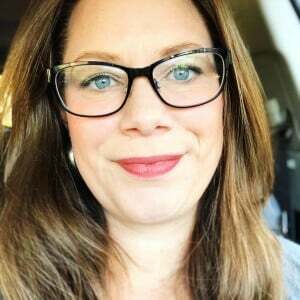 When I was thirteen our next door neighbor would throw fancy dinner parties and hire me to wear a white blouse with a black pencil skirt and pass hors d’oeuvres. She taught me how to walk in heels and make some quintessential appetizers. Bacon Wrapped Water Chestnuts being my favorite. They are super versatile, which is nice. If I’m feeding adults I tend to use whole water chestnuts and large chunks of bacon, but when there are little kids making passes at the table, I do a smaller version and half or quarter the water chestnuts. They can be eaten plain or served with a dip (I’m partial to something spicy) or you can sprinkle brown sugar before baking to sweeten them up. Any way you do it, be prepared to see them disappear quickly! 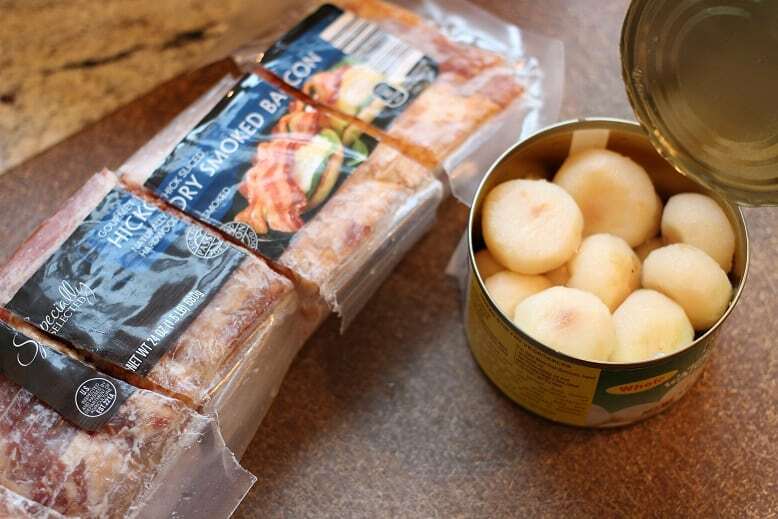 Cut bacon to a length that will wrap around the water chestnut . 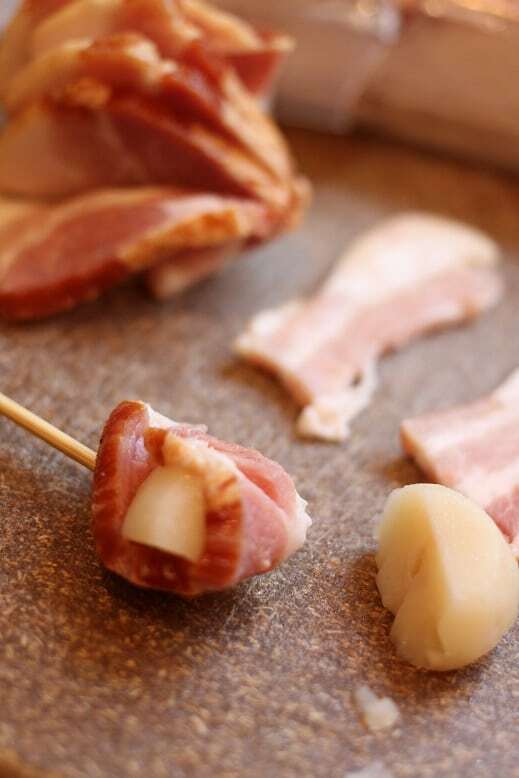 Wrap bacon around water chestnut and secure with a toothpick. Repeat and place in a single layer in a baking pan (make sure you're using a pan with sides, so you don't end up with a bacon grease fire!). If you're going to sprinkle with brown sugar, do so now. Bake at 375 for approximately 30-45 minutes, until bacon is cooked through and getting crispy. Serve with your choice of sauce (or not) and ENJOY! 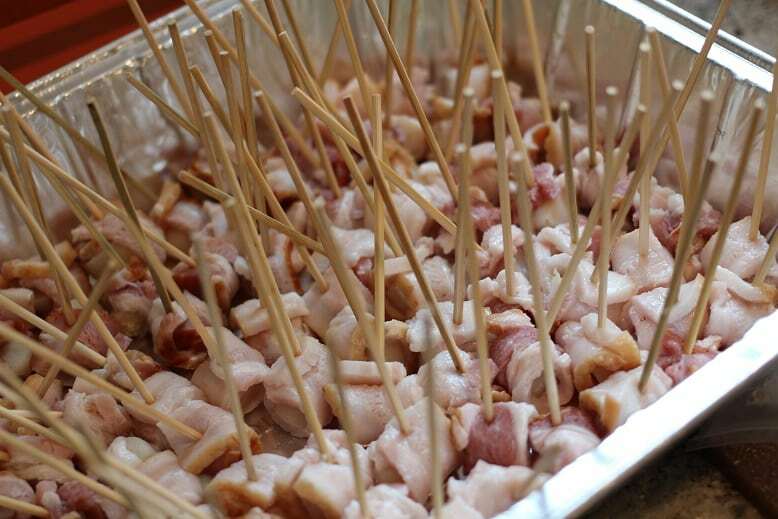 Wrap bacon around water chestnut and secure with a toothpick. Repeat and place in a single layer in a baking pan (make sure you’re using a pan with sides, so you don’t end up with a bacon grease fire!). If you’re going to sprinkle with brown sugar, do so now. « How to Get Your Kids Interested in Real Food. I grew up with these in the 70s. It was all the rage for cocktail parties. Now as a father and husband, my family and friends can’t get enough of them when I make them but once a year for New Years Eve. I broil mine instead of baking them. I also use a wire rack on the baking sheet to reduce the stickage.